By	Allyson Haymaker. Last edited by Marios Alexandrou on September 28, 2018. Want to visit a real castle without taking a trip to Europe? Hammond Castle Museum in Gloucester, Massachusetts is the real thing — a medieval-style fortress complete with towers, a drawbridge and even a dungeon. When a fellow camper told me about this place, I had to see it for myself, and I'm glad I did. 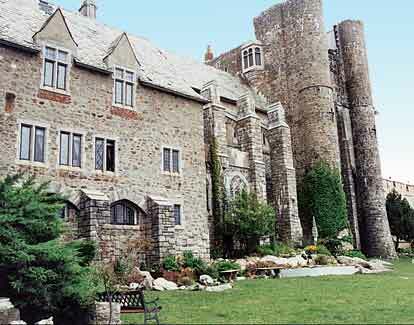 Completed in 1929, the granite castle sits on beautifully landscaped grounds overlooking the Atlantic Ocean. It was originally the home of John Hays Hammond Jr., the second most prolific inventor in American history, behind Thomas Edison. Dr. Hammond is best known for inventing the remote control, but he also had a hand in developing radar and FM radio. Dr. Hammond was interested in music, too, as evidenced by the massive 8,200-pipe organ in the castle's Great Hall. It's the largest organ ever built in a private home. The pipes reach from one floor below the organ to eight stories above it. The Great Hall is one of eight rooms you can see on a self-guided tour. 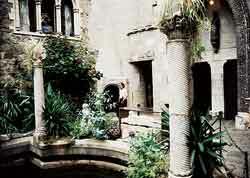 Other stops include the tower galleries, which display Dr. Hammond's extensive collection of Roman, Renaissance and medieval artifacts, and the Renaissance dining room. Perhaps the most delightful room is the indoor courtyard, a replica of a square in a French village. Plants thrive under a ceiling that provides artificial sunlight and moonlight. Even more amazing, this room can “rain” on command–anything from a gentle shower to a torrential downpour! The museum also offers group tours, educational programs and many holiday-related events and celebrations. (Candlelit productions of Shakespeare's Hamlet will be performed from Feb. 9 through March 17, 2001; call 1-978/283-2080 for reservations.) There's definitely something for everyone here! Gloucester is on Cape Ann, about 40 miles northeast of Boston. From State Highway 128, head east on Route 133 at Exit 14. In about 4 miles, you'll reach Route 127; from there, travel south for 1.3 miles to Hesperus Avenue. Turn left; the castle is about a half mile down the road. The castle, which is not wheelchair-accessible, is open year-round. But from November through May, it's only open on weekends from 10 a.m. to 3 p.m. Admission is $6.50 for adults, $5.50 for students and seniors and $4.50 for children ages 4-12. Call 1-978-z283-2080.